Summary (from Goodreads): It's been three years since the devastating accident ... three years since Mia walked out of Adam's life forever. My Summary: Three years after the accident that killed Mia's family - and very nearly claimed Mia's life as well - Adam is anything but happy. Having skyrocketed to fame after writing an award-winning album, Adam is living with his celebrity girlfriend, selling out to please the record label, and popping pills to keep himself from freaking out daily. Adam is a mess, and he's been one for almost 2 years - since Mia left him without a word of explanation. Then, on a stroll through town the night before the beginning of another tour, Adam sees a poster for a performance at Carnegie Hall; he buys a ticket and watches in amazement as the girl he once loved plays for thousands of people, having recovered completely from the accident. Awestruck and heartbroken, Adam plans to leave ASAP - until an usher approaches him, saying that Mia's asking for him in her dressing room. My Thoughts: Oh Mrs. Forman, why do you enjoy tormenting my little piggy heart the way you do?! 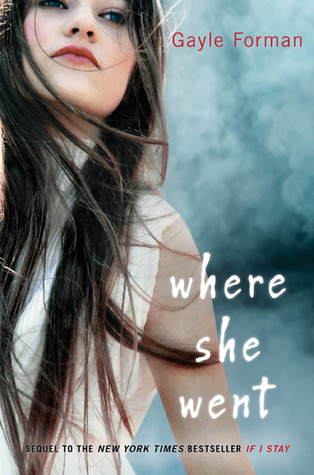 First, with If I Stay - I've never cried as much as I did while reading this book - and now with Where She Went, where I couldn't help but wish someone would just hug Adam and tell him everything was going to be all right again soon?! If there's one thing I know, it's that Gayle Forman can write heartbreaking novels. If I Stay was one of the very first contemporary YA novels I ever read, and it was because of If I Stay that I fell in love with the genre. On to the book: I found the songs at the beginning of every chapter really helped you understand how Adam was feeling, even when he didn't say it; they were definitely a great addition to the story. Also, I love the writing style the author utilizes - she tells the story in a forward way, while at the same time showing you what happened to lead the characters to where they are. And Mrs. Forman's writing is fluid and lyrical - poetic and yet still real and believable. And poor Adam... you can't help but feel his heartache and desperation, and just reading about his life after Mia makes you angry - 'how could she do this to him?!' was a question I asked a few dozen times. Final Thoughts: I definitely recommend If I Stay and Where She Went to anyone who enjoys contemporary literature, and definitely to anyone who loves a good love story. Make sure you have a box of tissues handy when you start reading! I have Where She Went on my counter right now, I just have to finish up one book before I start it and the wait is killing me! Glad to hear that you enjoyed it so much. Great review. I really need to read both these books. They sound so compelling and I need a good read! I just started a review blog, and I'm still trying to learn how to cut down my reviews since I know they are super long and NOBODY wants to read a review over 500 words! Lol. :)So if you could follow my blog or have any advise for me, I would love to hear from you! Thank you!